The port of Dubai is the largest and busiest cargo port in the Middle East. The Middle-East is home to some of the most important shipping hubs on the East-West trade route. It has one of the busiest shipping lanes in the world, handling over 43.8 million TEUs along the Asia to Europe shipping lane. The strategic location of the Middle-Eastern ports has made it possible to dominate in world trade. The recent growth in volume can be attributed to the aggressive investment in infrastructure by the governments and the expansion of inter-regional and global trade. Here are some of the busiest cargo ports in the Middle East. The port of Dubai (Jebel Ali) is the largest cargo port in the Middle East. The port was constructed in the 1970s and officially opened for operation in 1979. It is located 35km southwest of Dubai in the United Arab Emirates. The port covers 134 km squared and is reputed as the world’s largest man-made harbor. The port handles 170 million tons of cargo which is about as much as the four other busiest ports combined. It is the ninth busiest port in the world. 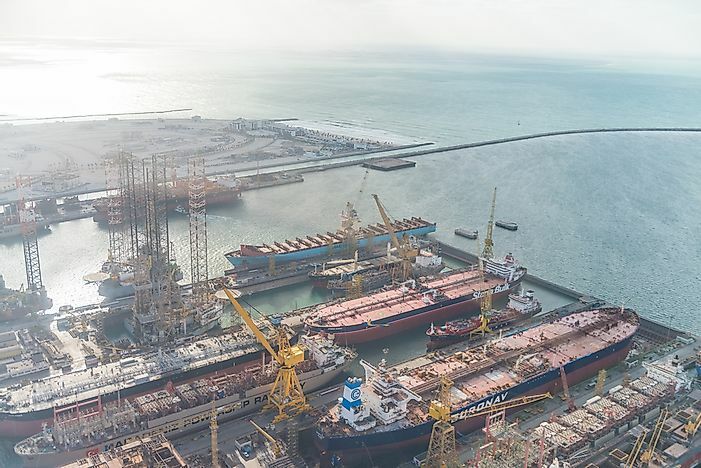 The port of Yanbu is located on the Red Sea coast on a natural harbor that is sheltered by the mainland on the north and east sides and coral reefs on the south and southeast sides. Construction of Saudi Arabia’s largest port began in 1975. The port handles dry bulk and general cargo. It is the second-busiest port in the region with an annual volume of 65 million tons of cargo. The port of Jeddah is a major port in Saudi Arabia and the third largest port in the region. It handles a cargo volume of 54 million tons which represents 59 percent of all sea imports in Saudi Arabia. It was officially opened in 1976 and has 58 berths of international standard. It ranks as the 32nd busiest port in the world. The port of Mina Sulman is a seaport located in Bahrain. The port was established in 1962 and was initially a natural harbor before it was expanded. Today, the port occupies 80 hectares of land and is the primary cargo port for Bahrain. It has 15 container berths making it a vital custom point of Bahrain. Mina Sulman port can handle 34 million tons of cargo per year. This makes it one of the busiest seaports in the Middle-East. The port of Haifa is the largest seaport in Israel. The port operates all year long handling both merchant and passenger ships. It is seated on a natural deep-water harbor which allows it to load and discharge freight volumes of up to 23.9 million tons per year. It is the largest eastern Mediterranean port. The port of Haifa is located on the north of Haifa downtown and stretches for about 3 kilometers along the shores of the city. Other important ports include Dammam, Shuwaiba, Ashdod, and Aqaba. These ports offer a strategic gateway to the Middle-East and neighboring regions. They are also outlets for trade between the Middle East, Asia, and Europe.